FingerTec Keylock 6600 Series effortlessly delivers security and sophistication to your access control with a combination of fingerprint verification technology, password and mechanical key to safeguard your property; its sleek design and robust structure adds the solid and exquisite appearance to your space. 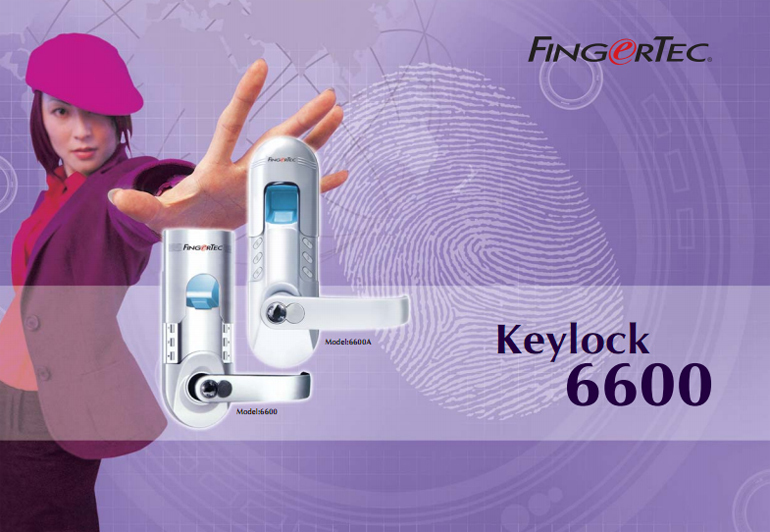 FingerTec Keylock 6600 Series is capable to read almost all types of fingerprints and in addition to its stylish scanner protection; the lock secures the scanner for excellent reading everytime. The unlocking methods of fingerprint and password employed by the FingerTec Keylock 6600 Series provide user with extra comfort and safety. With the FingerTec Keylock 6600 Series, you can leave your room without having to worry about your keys anymore. FingerTec Keylock 6600 Series brings door lock to a new level of elegance and making your door the center stage of the room. Features three types of secured locking methods which include fingerprint, password and mechanical key for better protection. Keylock deploys the cutting edge matching fingerprint technology to ensure reliability of every fingerprint reading. Keylock is equipped with a cover which slides upward to protect the scanner from dust, moist, and weather effects, for a longer lasting and a more reliable scanner. Keylock employs nanotechnology and its pure stainless steel mechanical rotating structure can make it lasts for 10 years under normal usage. No additional hole is required to install Keylock, as it utilizes the existing doorknob hole available. Only four 1.5V standard alkaline batteries needed and with its energy saving design, the batteries can last up to 15,000 unlocking activities under normal use. Supports 9V battery as backup power when internal battery is flat.